An Honor Bilt Ashmore in Minneapolis still looks great some 80 years later. is a mecca for Arts and Crafts collectors. collections; now here’s the author’s own home. relaxation at a Minnesota vacation cabin. Learn the stories behind a fireplace surround, Wright-esque art glass windows, a Royal Morris chair and a twin “cover girl” lamp. Arts and Crafts tiles, tables and trash cans. in their New Jersey studio. 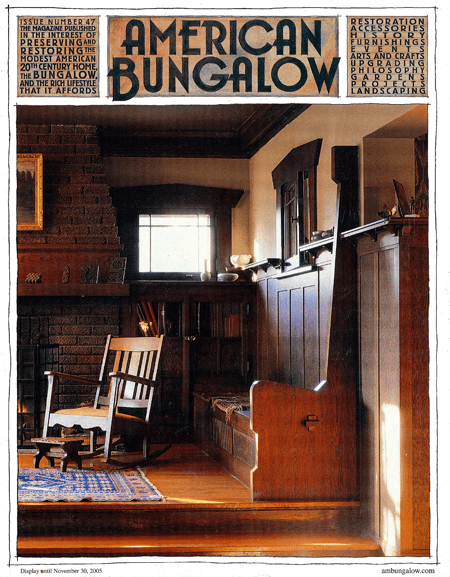 calendar and catch up on bungalow news.